Stand straight with hands folded in Namaste position (palms touching each other in front of chest). Shift weight on your right leg, and lift left leg to touch right thigh as high up as possible. Toes of the bent leg should point straight to the floor. Lift both hands upwards and stretch. As you gain a better sense of balance, you should be able to do both these steps simultaneously. 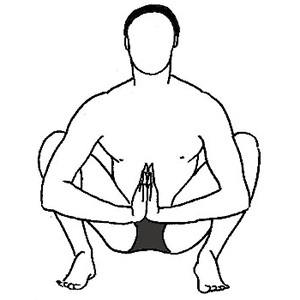 Hold position for 10-30 seconds before reverting to initial position. Repeat on other side. This will complete one rep of Tree pose. Make sure your bent knee is not folding forwards. It should be stretched on the side creating a tension in the groin area. Instead of folding hands and lifting them up above the head, you can use support of wall or chair. 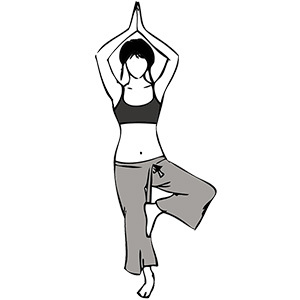 Read Tree Pose (Vrksasana) for further details. Stand straight with hands on the sides and feet 3- 5 inches apart. Spread your toes and sole to holdthe ground firmly relaxing, and acquiring as much surface area of ground as possible. Gently lift your arms sideways forming an angle of 20 degrees on both sides, lift and push your body upwards. As you balance your weight on the balls of your feet, you should feel a tension in your ankles and knees while your lower back tightens. Hold the position for 10-30 seconds and revert to the starting position. You can use support of a wall or chair initially. Read Mountain Pose (Tadasana) for further details. Raise arms to sides, shoulder height and stand straight. Choose a spot ahead of you and focus on it to keep you steady as you walk. Walk in a straight line with one foot in front of the other, as one does on an aerial tight rope. 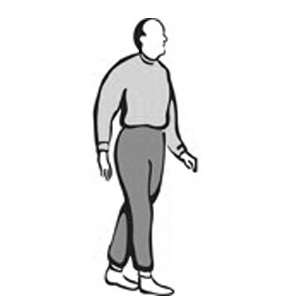 As you walk, lift your back leg. Pause for 1 second before stepping forward. Repeat for 20 steps, alternating legs. Then do the same backwards. You can use support of a wall initially. Choose a spot ahead of you, and focus on it to keep you steady as you walk. Take a step. Put your heel just in front of the toe of your other foot. Repeat for 20 steps forward and backward. Stand straight with hands on the sides and feet shoulder width apart. Spread your toes and sole to hold the ground firmly relaxing, and acquiring as much surface area of ground as possible. Gently lift your arms upwards, while bending knees and hips. Push your body downwards. As you balance your weight on balls of feet, notice a tension in your thighs and calves. Hold the position for 10-30 seconds and revert to the starting position. You can use support of a wall or chair initially keeping your hands in the front. Stand with your feet shoulder width apart and hands folded in Namaste position (palms touching each other in front of chest). Feet twisted outwards in an angle. Gently bend your knees, and hips. Keep bending till you can. The ideal position is 4-5 inches above floor. Your hands should be a little away from your body. Hold the position for 10-30 seconds and revert to the starting position. You can use support of a wall from front. Read Elimination Pose (Malasana) for further details.